1. Armistice Day – As they have done for several years, Britain stood still again today at the 11th hour of the 11th day of the 11th month. Originally to commemorate the end of World War I, 91 years ago, it is now the day of remembrance for fallen soldiers in all wars. This year’s Remembrance Day is particularly poignant because of the increasing number of casualties from the war in Afghanistan. Only yesterday, six of the fallen heroes were repatriated to Britain fuelling a serious discussion about British involvement in the war. Another dimension to this year’s event is that for the very first time, there is no survivor from the Great War to witness the 2009 ceremony, the last three men to have fought in the First World War - Bill Stone, Henry Allingham and Harry Patch - have all died since the 2008 Remembrance Day. I must confess that I admire the way the British honour their war heroes. The ceremony of repatriating bodies of fallen soldiers is soberingly colourful and is usually handled with dignity and respect for the dead and their families. Each fallen soldier is named and remembered in Parliament by the Prime Minister and leaders of the main political parties. Two weeks before Remembrance Day, people start to wear a poppy to remember the fallen dead. 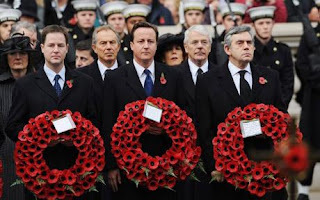 Also, come rain or shine, the Royal Family and leading politicians in the country will unfailingly throng out side by side on Remembrance Sunday (the nearest Sunday to Armistice Day) to pay their respect to the war dead by laying wreaths at the Cenotaph. The Last Post is played and the the men and women who have made the ultimate sacrifice for the freedom enjoyed by all are remembered. Britain is a country that honours its people, dead or alive. No wonder; it needs no re-branding process to make its citizens patriotic. I wish our government in Nigeria will begin to honour our people starting with the living by providing basic health care, good roads, education for children and food and water for the poor. I hope it will honour those who die in war and on our roads by ensuring that the causes are eliminated. I am optimistic this will happen. · Never mind a black-out that covered a large section of Brazil for four hours, 100% of Nigeria i.e 140 million people are permanently thrown into darkness EVERYday. · Our President has promised 6000 megawatt electricity generation by December this year. Let me make a prediction, come December, the government will accuse anything and everything as the reason why they can not achieve this. · Sky news will have sufficient news fodder if it only reports on the enduring Nigerian black-out.